Coach Micks' plan for the coming week (April 22-28) is HERE. Coach Micks 1-page Track Racing Preparation document is HERE. Boys training: contact Coach Nash. For training for the cross country and distance events (800, 1600, 3200) in track, we will follow a phased approach. Starts with 3 week build-up to miles/week of previous season. See mileage build-up tables below to see how this should be done. After getting up to target miles/week, maintain while adding 6-10 short hill (or flat sprint) repeats one day/week, and steady tempo (aerobic threshold) one day. The objective is to work on some fundamental pieces while not using a lot of adrenaline. starts a set number of weeks before the target meets at the end of the season. 15-16 weeks before end of season. Mid-January for track. Mid-July for Cross Country. For 3M/5K (Cross Country), 1600, 3200, add longer hills and lactic threshold tempos. For 800, longer hills and hill circuit runs. And start racing (September for cross country; March for track). without the heavy stress of hard workouts at race pace. Every workout ends with some speed. 100s for 800. 150s/200s for cross country, 1600, 3200. Third phase (late-September, October for cross country; late March, April for track) tunes body for race paces and takes into peaking mode. Can last no more than 6 weeks. So starts about 8 weeks before end of season. Late March for track. Late September for Cross Country. Has hard workouts at race paces. Develops potentials, but also tunes the body for race specific paces. Includes weekly races. Takes a lot adrenaline. This phase can only last 4-6 weeks and precedes the target competition period. For cross country, we often use a fartlek workout at race pace: 2-4x(4:00 race pace/3:00 jog). 800: 300s with 3:00 recovery. 1600: 600s with 4:00 recovery. 3200: 800/1000s with 3:00 recovery. All workouts end with some speed. 100s, 150s, or 200s. is the period with the target races (County and League 3 for XC; County, League Final for track). About 2-3 weeks. So starts 2-3 weeks before end of season. Workouts are shorter but at same qualify level as phase 3. Training effect to get faster now comes more from important races than from workouts. With easy pace miles and light workouts at race-pace to maintain capability between races. 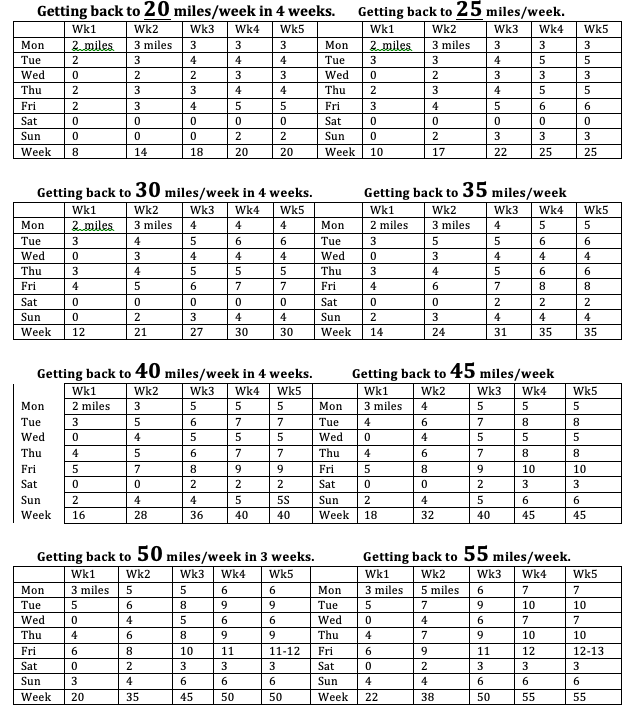 Tables below show a recommended way to take 3 weeks to get back to the miles/week that you were doing during last cross country or track season and maintain that miles/week after that. Wk1, Wk2, and Wk3 are the build up weeks. Week 1 is 40% of target. Week 2 is 70%. Week 3 is 85%. Wk4 and Wk5 are at 100% of the goal miles/week. If you would like to download the mileage build-up tables click HERE. All miles at easy pace during the build-up. Table shows long on Friday, short/off on Saturday., Medium run Sunday. --> Those can be interchange. i.e. Long run can be done Friday, Saturday or Sunday. Do 4-6x short hills (60m) or 100s on two other days. (Tuesday and Thursday). Warm-up first, then do the hills/100s, then go for the run. We’ll start doing harder workouts (long hills (150s/300s, tempos, etc.) after you are back up to target miles/week for a few weeks. Spend at least 3 weeks at your track-season miles/week before increasing by 5 miles/week . And then that will be your goal miles/week for cross country.